The bulk carrier Alam Manis ran aground at Cargados Carajos Shoals on 800 nautical miles North-North-East of Mauritius. The vessel was en route from Richards Bay to India, but after engine failure stuck into the sandy shallows. The vessel hardly stuck and crew was not able to refloat by own means. 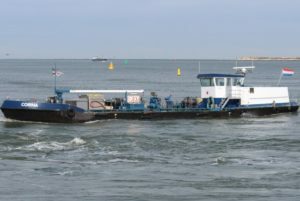 The accident was reported to the local authorities and was requested assistance with refloating. 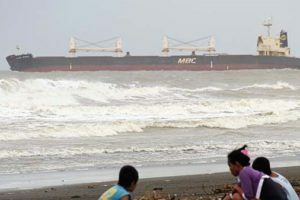 At the scene of the accident was dispatched salvage tug and divers, which will hold an underwater inspection of the grounded bulk carrier Alam Manis for possible breaches and water ingress. The vessel will be refloated after assessment of the underwater condition and proper weather conditions. During the grounding there were no injured people and no water pollution reported. The investigation for the root cause of the accident is under way. During the accident the vessel was under load en route from Richards Bay to Pipava, India. The Handymax bulk carrier Alam Manis (IMO: 9397834) has overall length of 190.00 m, moulded beam of 32.20 m and maximum draft of 12.60 m. The deadweight of the ship is 55,652 DWT and the gross tonnage is 31,238 GRT. The vessel was built in 2007 by Mitsui Ichihara Engineering and Shipbuilding in Japan. The owner of the bulk carrier is Japanese Kashima Naviera, but operator is Philippines company LEO Shipmanagement.